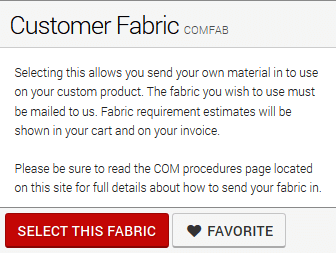 COM fabrics must be readily available in the market place at competitive prices in the event Custom Pillow Source needs to replace the fabric due to loss or damage. We reserve the right to decline fabrics that we deem to be difficult or problematic. For example, we do not sew texelene or sheers. Custom Pillow Source liability for lost, misplaced, or damaged fabrics will not exceed $50 per yard. Proof of purchase with pricing may be required.